When you think of the color spectrum, invariably you get transported back to your high school science class where you first learned about ROYGBIV. In Primary, the powers of the color spectrum are harnessed to attack, defend, cycle, and draw, with each player using their own custom mix of cards that aligns with their personality and play style. Will Primary shine bright among card games, or will it dull to grey? Read our preview to find out! Primary is an abstract strategy card game for 2-4 players that plays under 30 minutes. Primary plays best with any number of players. In Primary, each player constructs a deck composed of sets (a set being five cards numbered 1 through 5) in colors of their choice. Each of the six colors has a variety of powers that allow you to attack your opponents, defend yourself against future attacks, draw cards, and cycle cards through various discard piles. Primary color cards (red, blue, yellow) can be combined to take on the powers of secondary color cards (purple, green, orange), and the secondary color cards can be split into primary color cards, giving a wide range of strategic flexibility. The winner of the game is the last player who has cards in his deck. In Primary, players can attack opponents hand, discard pile and draw deck with the goal of being the last player remaining in the game. Where the components fall flat for me is the lack of explanation of card function on the cards themselves. 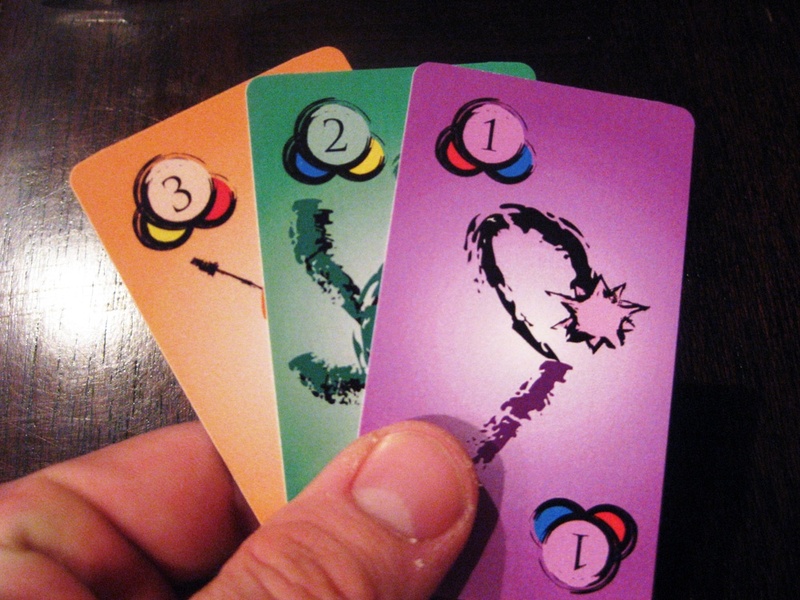 Each color has 2-3 powers to choose from when the card is played, and the only place to find these powers is on the separate reference sheet. While the rule text of the powers is rather long, some sort of indicator or reminder (through key words or through an icon system) would make the game play faster and easier. Red: Discards cards from your opponent’s deck, or fades cards from opponents discard pile. Yellow: Draws cards into your hand, removes or copies a defense counter in play. Orange: Moves cards from opponent’s faded pile to your deck or from opponent’s discard pile to your discard pile or from your opponent’s deck to your faded pile. Purple: Force your opponent to discard a card from their hand, or remove a defense counter. If you’re feeling particularly aggressive, you can build a deck of mostly red & orange cards, while if you’re feeling more defensive, and go more blue & green. If you’re feeling scattered (or if you’re playing your first game) you can build a deck with all the colors, giving you a nice balance between offense and defense. There are four areas of play in Primary: your hand, your deck, your discard pile and your faded pile (which contains cards that are more difficult to recover by a player, and more vulnerable to steal by your opponents). Each area of play can be defended via defense counters, which allow you to cancel an opponent’s action targeting that area. 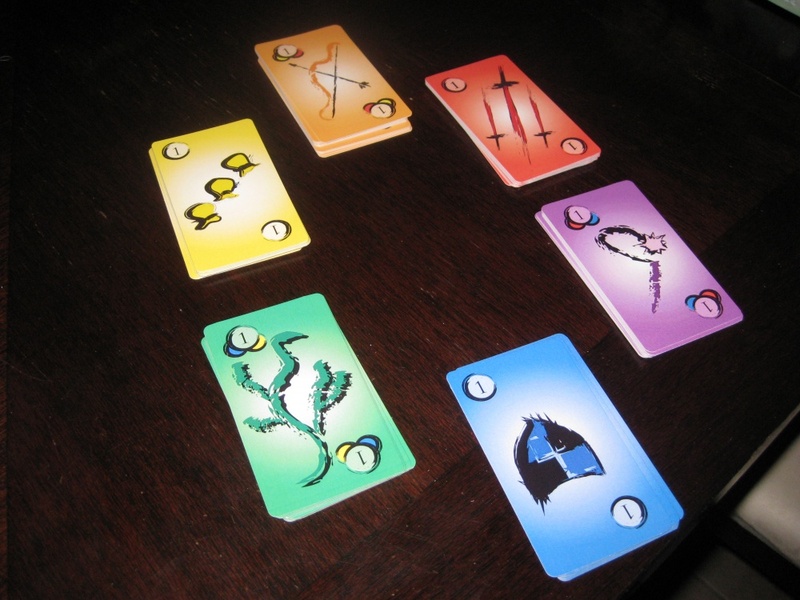 The sequence of game play is straightforward: draw a card, play a card (or cards), and then resolve your actions. When you play cards, there are a number of options available to you. You can play a single card and take those actions (ex. play a yellow #5, take 5 yellow actions) or a string of matching cards (ex. play a red #2 and a red #3, take 5 red actions). You can also combine primary cards into secondary effects (ex. combine a blue #3 and a yellow #3, take 6 green actions) or split secondary effects into primary effects (ex. split a purple #4 into 2 blue and 2 red actions). After you make your play, the next player in order takes their turn. 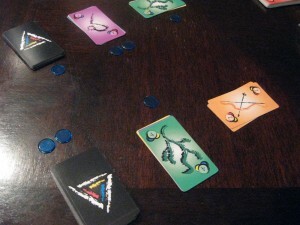 Through the course of the game, cards will move between discards, faded piles, hands and decks, with each player’s deck inevitably running low or out of cards. Eventually players will be eliminated by not being able to play a card on their turn or not being able to sacrifice a defense counter to skip their turn. The winner is the last player who is still in the game! Each of the 6 different colors in Primary has a different function in the game and will alter your play style. The rules and game play of Primary are easy to pick up. Deck building is handled easily with a limited pool of cards available to each player, and players able to cater to their playstyle through the simple choosing of colors. The mechanic of attacking and defending each play area (hand, deck, discard) is very similar to the Runner/Corp interaction in Android: Netrunner, and players with a passing familiarity with those rules will be able to pick up Primary even faster. That said, the players in our group who had not played Netrunner before were very quick on the uptake, and were able to get the mechanics down after a few rounds of play. The strategies behind deck building in Primary are not readily apparent and take a few plays through to see how the colors interact within an overall strategy. In our games, we tried decks that contained each color, decks that had only primary or secondary colors, and decks that were purely offensive or defensive. Only after playing through all of these, did we feel we had a decent enough grasp of the functions and interactions to try creating our own custom decks. We hoped that we would find some suggested starting decks (similar to the suggested playsets in Dominion) and highly recommend that the designers add them to the final published game. Secondary colors have their own powers, or can be split into their component primary color powers. The mechanics of splitting and blending provide game play that is subtle yet highly flexible, adding to the overall strategic aspects both during the deck building phase and during play itself. For instance, if playing a highly offensive deck, playing a set of purple cards may be beneficial because it can be split between red and blue powers, giving a defensive option without taking up a space for a purely defensive card. The key concept to master is to know when to blend cards, when to split cards, and when to play cards straight. While abstract in nature, we found that Primary integrates its core concept of the color spectrum effectively into the rules and game play, and added to the ease with which the rules were mastered. Care needed to be taken to remind everyone to think in finger paint colors, not in RGB color codes; more than one web designer kept forgetting that green was a secondary color during our plays. One of the nice additions to the rules was the variations in play. Rules for team play, balanced free-for-all (only attacking the player to your right) or complete free-for-all rules were included, and gave some replay value and options when playing with more than two players. That said we found that the game played just fine with the standard rules for two players. Primary is a nice game that will appeal to players looking for a strategic, customizable card game with a limited card pool. The abstract nature of the game can provide for broad appeal to gamers who aren’t necessarily into themes of fantasy/sci-fi, and the straightforward rules make it easy to pick up. The rules are easy to learn and the limited card pool makes building decks quick and easy. Primary is held back slightly by the design of the cards forcing players to refer back and forth to reference sheets. It would also benefit from some suggested starter decks to help out new players. Overall though, Primary is a solid example of an abstract card game with subtly strategy. If you are interested in the game, it’s currently funding on Kickstarter and scheduled for delivery in June of 2014. A pledge of $25 will get you a copy of the game and any stretch goals. You have until Thursday, March 27th to become a backer so head over today if you are interested.